Two hose model cutting torches are a "straight through" high performance design that minimizes turbulence and improves cut quality. Connection: B fitting (9/16 - 18). Straight through design - minimizes turbulence, improves cutting performance. High performance mixer design - provide optimum performance. Rugged brass - torch head and body for maximum strength. Pre-drilled 1.38 Inch diameter barrels for three position mounting flexibility. Founded in 1948, we are a proud, three-generation, family-owned and operated business. Leading the industry in scrap and demolition supplies, we can provide you with all of your torching, welding, and safety needs. 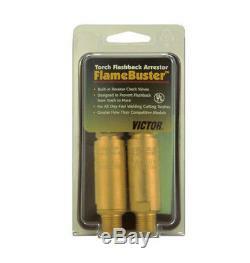 Stocking over 300 long torches and 4,000 tips, we carry the highest-quality brand names. All orders are processed during that time frame. Damage inflicted by the user is not covered. 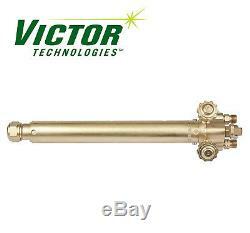 The item "Victor MT210A Machine Cutting Torch with Flashback Arrestor, Part# 0380-0217" is in sale since Tuesday, February 6, 2018.